Returning to Brighton from Dieppe recently I realised that the AIS was not working, but had not time to fault trace or fix it so I thought I would revisit using the radar in earnest. This is crucial given that the Traffic Separation Scheme that separates the Channel into two one way traffic streams for large vessels adds to the excitement for a yacht – as they say a “tortoise crossing the motorway” – gives you some idea of the experience. The rather shaky photo here – sorry but we were bouncing up and down a bit! – and I didn’t want to leave the helm too long just to take a photo! 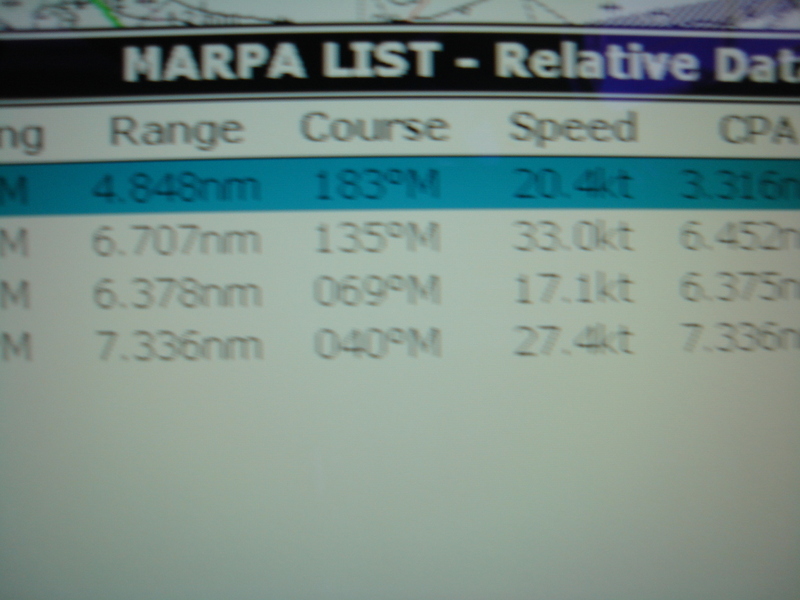 – shows the MARPA targets acquired on the Raymarine (C120 + Raymarine Radome 2kw) – click on the image for a larger view. The bottom line is that standing in the cockpit with a pair of binoculars and taking bearings was my chosen primary source of data…and although we had bowled long from Dieppe for some 8 hours on a close reach doing 6.5 to 9kts with only the occasional sail trim adjustments… I was forced to reel in the genoa and come to a standstill to let an imposing cargo vessel from Iran thunder past. Good decision as it turned out since it took a good 10 minutes to cross the wake after it had passed by!. 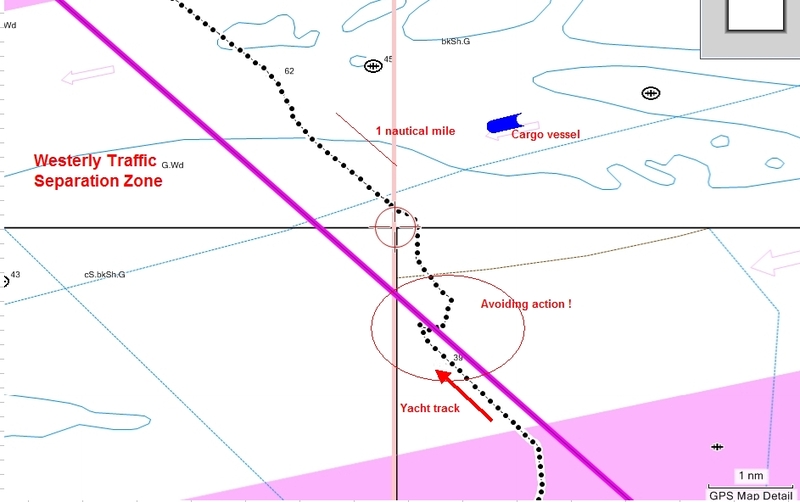 This screen shot shows our track as we took avoiding action and then tried to get underway again before the next charging container vessel came barreling down the track. Russ August 9th, 2008| No comments - be the first!|Tags: Navigation - Radar - Raymarine. Collision avoidance – ARPA , CPA or …what? If you have a Radar it will probably be set to use ARPA to assist you in deciding whether you are on a collision course with another vessel . 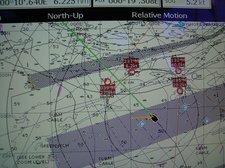 Many yachts have now added AIS to their nav electronics and can overlay the AIS targets on to the Radar and chart plotter display to add more information. 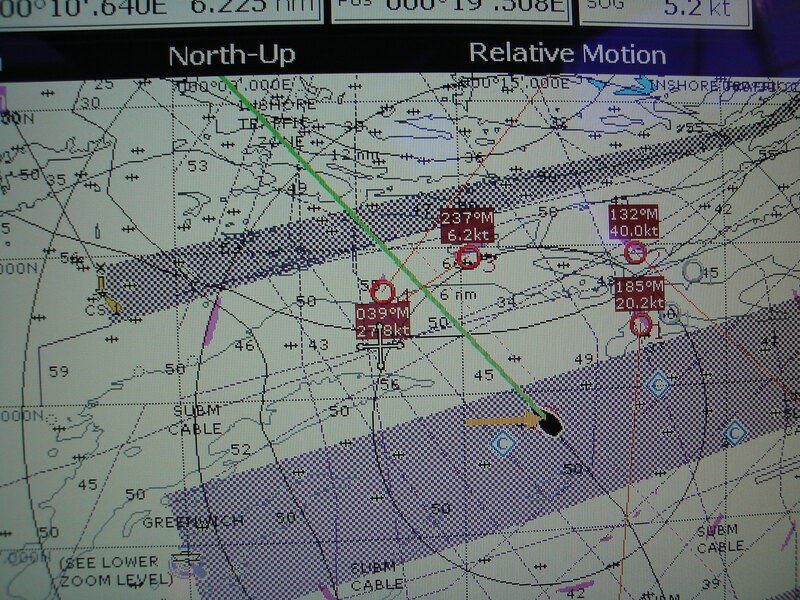 So far the logic is that you calculate the Closest Point of approach (CPA) and Time to Closest Point of approach (TCPA) and make a judgement on which way to turn according to the Collision Regs. SafePass is an idea from Fred Pot of SeaCAS. In this scheme the system calculates various CPA/TCPA results and plots “safe” and “dangerous” zones on your current heading to make it even easier to decide which new heading may be appropriate for your vessel. This depends on the other vessel not changing course and also on the circumstances of the impending collision with regard to the Collision Regs of course. Russ February 24th, 2007| 2 comments - be the next!|Tags: AIS - Radar. 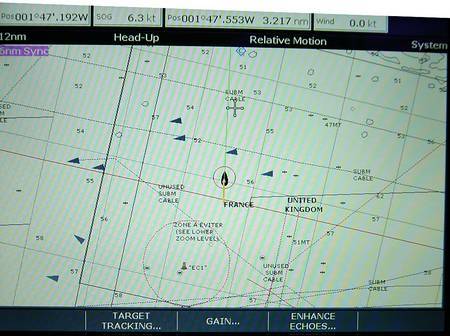 Here you can see that I was less than 1nm away from the approaching vessel on the starboard bow and the vector drawn out in front of the vessel represents 12 minutes sailing at the vessels current SOG – in fact the pop up says that I was 8 minutes from being run down…luckily that didnt happen…! Russ September 27th, 2006| No comments - be the first!|Tags: AIS - Electronics - Navigation - Radar - Software. Firstly there is the ‘old’ system – now 11 years old.. 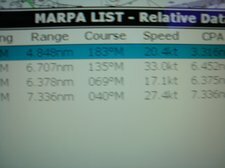 The Philips navigator is really good. Its visible under the spray hood, and is always pretty much in agreement with the new system (all Raymarine based) that I run in parallel. Since the cockpit is small I had no room for a new Raymarine screen on the helm – never mind the cost! – so I put the new Raymarine C120 at the chart table and use my trusty old Phillips navigator in the cockpit. Russ September 24th, 2006| No comments - be the first!|Tags: AIS - Electronics - Radar - Raymarine - USB Adaptors.